A Gtk.CellRendererText renders a given text in its cell, using the font, color and style information provided by its properties. The text will be ellipsized if it is too long and the “ellipsize” property allows it. You can then connect to the “edited” signal and update your Gtk.TreeModel accordingly. 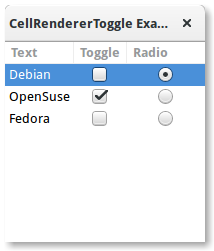 Gtk.CellRendererToggle renders a toggle button in a cell. The button is drawn as a radio- or checkbutton, depending on the “radio” property. When activated, it emits the “toggled” signal. As a Gtk.CellRendererToggle can have two states, active and not active, you most likely want to bind the “active” property on the cell renderer to a boolean value in the model, thus causing the check button to reflect the state of the model. 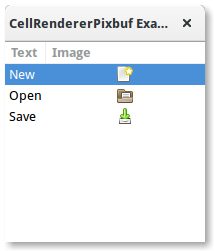 A Gtk.CellRendererPixbuf can be used to render an image in a cell. It allows to render either a given Gdk.Pixbuf (set via the “pixbuf” property) or a named icon (set via the “icon-name” property). 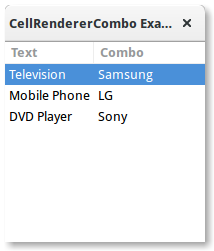 Gtk.CellRendererCombo renders text in a cell like Gtk.CellRendererText from which it is derived. But while the latter offers a simple entry to edit the text, Gtk.CellRendererCombo offers a Gtk.ComboBox widget to edit the text. The values to display in the combo box are taken from the Gtk.TreeModel specified in the “model” property. The combo cell renderer takes care of adding a text cell renderer to the combo box and sets it to display the column specified by its “text-column” property. A Gtk.CellRendererCombo can operate in two modes. It can be used with and without an associated Gtk.Entry widget, depending on the value of the “has-entry” property. 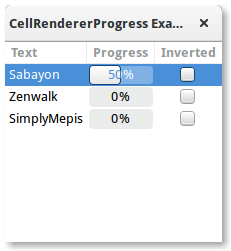 Gtk.CellRendererProgress renders a numeric value as a progress bar in a cell. Additionally, it can display a text on top of the progress bar. The percentage value of the progress bar can be modified by changing the “value” property. Similar to Gtk.ProgressBar, you can enable the activity mode by incrementing the “pulse” property instead of the “value” property. 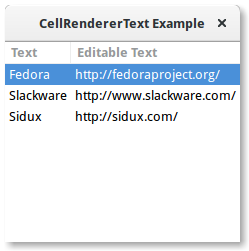 Gtk.CellRendererSpin renders text in a cell like Gtk.CellRendererText from which it is derived. But while the latter offers a simple entry to edit the text, Gtk.CellRendererSpin offers a Gtk.SpinButton widget. Of course, that means that the text has to be parseable as a floating point number. The range of the spinbutton is taken from the adjustment property of the cell renderer, which can be set explicitly or mapped to a column in the tree model, like all properties of cell renders. 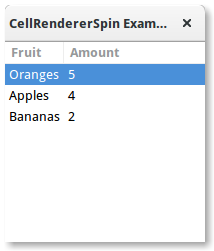 Gtk.CellRendererSpin also has properties for the climb rate and the number of digits to display.